I’m running a workshop on art and film and yesterday we discussed ‘realism’. I spoke about how Michelangelo Antonioni’s film Red Desert (his 1st colour film) moves between ‘realism’ and ‘not-realism’ in his psychological drama about a woman’s inability to cope with the stresses of modern life. I showed how one way he did this was with reference to Giorgio Morandi’s paintings, which explore the arrangement of forms. although Morandi’s works are still lifes, they are architectural, and make us think about how the arrangement of forms communicates within the frame . Morandi sometimes painted the domestic objects he used in his still life compositions, with matte paint. 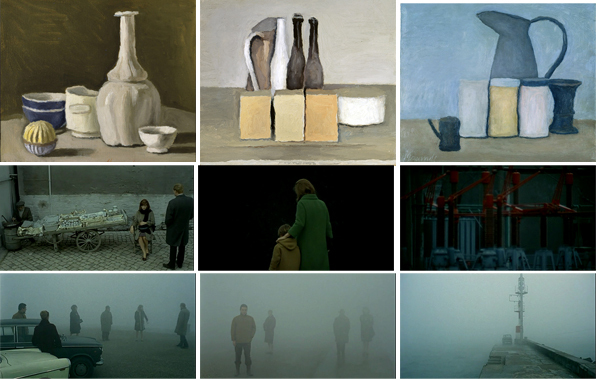 In Red Desert, Antonioni painted the wares on the market stall in matte grey paint; the color and the forms both indicate something about the protagonist’s state of mind.Red Desert is a powerful and affecting film and stunning in the depiction of harsh beauty of the winter industrial landscape.